Waves crashing on to Australia's southern shores each year contain enough energy to power the country three times over, scientists said on Tuesday in a study that underscores the scale of Australia's green energy. The research, in the latest issue of the journal of Renewable and Sustainable Energy, comes as the nation is struggling to wean itself of years of using cheap, polluting coal to power the economy and to put a price on carbon emissions. Oceanographers Mark Hemer and David Griffin from the state-funded research body the CSIRO looked at how wave energy propagates across the continental shelf and how much is lost. The aim was to build a picture of the amount of energy on an annual basis and how reliable that source is. Australia has committed to reducing greenhouse gas emissions by 60 percent of year 2000 levels by 2050. 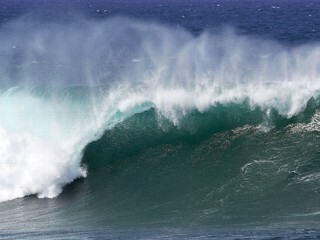 Although an economic analysis of wave generation in Australian waters has yet to be carried out, Hemer says that wave energy offers a "massive resource" to contribute to the Australian Government's aim of producing 45,000 gigawatt-hours/year of additional renewable energy before 2020. "Convert 10 percent of available wave energy from a 1000-km stretch in this area to electricity, " Hemer says, and "the quota could be achieved by wave energy alone." Currently, Australia consumes about 130,000GWh of electricity each year. The World Energy Council has identifying its southern margin as one of the world’s most promising sites for wave-energy generation. "Averaged over the whole year, Australia's southern coastline has a sustained wave energy resource of 146 gigawatts (1,329 terawatt-hours/year)," the researchers say in their study, or three times Australia's total installed generation capacity. The government, facing an election on Saturday, is under pressure to put a price on planet-warming carbon emissions and further boost investment in cleaner energy. The country is one of the developed world's top carbon emitters and relies on coal to generate about 80 percent of its electricity. Hemer and Griffin's work has created a series of maps of the coastline that helps wave power investors find the right sites and design projects that can cope with calm and stormy conditions and how frequent these might be. The researchers don't advocate any particular wave power technology. But there are three firms in Australia developing technologies, including Fremantle-based Carnegie Wave Energy, which has a system based on large buoys suspended just below the surface near the shore. Hemer and Griffin's estimates are based on the amount of energy along the coast at 20 meters deep, since many emerging wave power systems are likely to be at that depth or less. Ideal sites included Portland in Victoria and Albany in southern Western Australia because of easy grid connections.